Everyone knows how important saving is, but it’s not always easy to find that extra money in the budget. Between paying off debts, covering your monthly expenses and having a little fun money, there’s not always a lot left for the savings account. If your savings account is on life support, you’re not alone. A 2017 GoBankingRates survey showed 57 percent of participants had less than $1,000 in savings, and 39 percent had $0 in savings. If you fall into those categories, changing your habits in small ways can add up to big savings over time. Whether your dream is to build a huge nest egg, take a luxurious vacation or just be debt-free and comfortable, saving money a little at a time helps you get there. It’s easy to let daily expenses add up without realizing just how much you’re spending. A $5 latte on the way to work? No big deal. But multiply that by five, and suddenly you’ve spent $25 during the workweek. Over the course of the year, that’s $1,300 that could go to your savings. See how quickly those small dollar amounts accumulate, whether you’re spending or saving it? We’re not suggesting you give up every latte that tempts you on your morning commute, but moderation is key to those daily expenses. When you cut back and put that money in your savings account instead, the saved money becomes a motivator, encouraging you to save even more. Groceries, eating out, entertainment, clothes, and splurges at the store account for those daily spending habits. Americans spent an average of $4,049 per year on groceries in 2016, according to the Bureau of Labor Statistics Consumer Expenditures report. Grocery shopping is one easy area to cut expenses. Saving at the grocery store takes a little prep work, but the meal planning you do now saves you time and money later. Start by writing a list of the meals you make on a regular basis, or new meals you want to try. Include side dishes on the list. You can also make lists of breakfasts and lunches, so you have the food you need for all meals. Now, plug those meals into a calendar for the week or month. Once you create a few weeks of menus, you can just recycle the menus to make future meal planning easier. Planning each meal helps you write a grocery shopping list with only the ingredients you need to minimize those extra purchases that bump up your total. You’re also less likely to eat out because you have everything ready. Use these additional tips to keep food costs low. Write a specific grocery list: Include everything you need for the week. Better yet, buy all the nonperishable foods for the full month to cut down on the number of shopping trips you take. You can buy meat for the month and store it in the freezer. Make a few trips throughout the month to pick up dairy, fresh produce and other perishables. Stick to your list: It’s easy to toss in a few extra things at the grocery store, but adding too many impulse buys can take your food budget off course quickly. Stick to your list when shopping, and avoid going down aisles where you know you don’t need to pick up anything. Plan your meals around grocery ads: Decide what to serve each week based on the deals at the grocery store. If chicken breast is on sale, plan several chicken meals and skip the full-price pork roast for the week. Stock up when prices are low: Find a great deal on something you use often? Stock up while it’s at the lowest price. This strategy is especially useful for canned goods and other items with long shelf lives. Creating a stockpile gives you low-cost meal options when money is tight. Pay with cash: When you pay with a credit or debit card, you don’t think about how much you’re spending. It’s easy to go over the amount you allocate for food. Instead, withdraw just enough cash to cover your food expenses based on your budget. If you allocate $120 per week to groceries, only withdraw that amount. It’s so tempting to grab takeout on your way home or eat out for lunch every day, but those meals add up quickly. The average amount spent on dining out in 2016 was $3,154 per year. Start by figuring out how many times per week you eat out right now. Add up the amount you spend on those meals. Then, plan to scale back your restaurant dining. If you go out for lunch every workday, cut back to only twice per week. Meal planning helps you avoid the urge to dine out. Prep your meals for the week on Sunday, so you have no excuse for ordering pizza at the spur of the moment. Cook and portion out lunches on the weekend, or cook a little extra at night to have leftovers for lunch. Don’t give in to eating out on a whim. Plan your meals out in advance, so you can budget for them and aren’t tempted to go out more than planned. Save money when you do dine out by taking advantage of loyalty programs. It’s common for restaurants to have phone apps or membership cards for free programs. Each time you dine at the restaurant, you earn points or credit based on the amount you spend. You can turn in those points for free meals or discounts. The average American spent $2,913 on entertainment in 2016. If you’re a social person, it’s easy to go over your budgeted amount in that category. It’s tough to say no when you get invited to fun activities. Try to plan your entertainment spending in advance, so you don’t go overboard with spending. Another option is to take charge of the social event planning for your group. Suggest cheap or free entertainment options in your area, instead of waiting for someone else to plan something that could come with a high price tag. Plan home get-togethers instead of outings at restaurants, clubs or music venues. When you do go to events or activities, look for discounted pricing. Groupon offers discounts on many local entertainment options. Sometimes you can save money by purchasing tickets to events ahead of time. How do you stack up to the 2016 average apparel and services expenditures of $1,803? You need clothes appropriate for your job, and you want clothes that fit your personality when you’re not at work. Sticking to a budget for clothing purchases prevents overspending. Shop the clearance racks to find deals. When shopping for clothes online, use sites like Swagbucks and Ebates to get cash back on purchases from certain retailers. You can also search for coupon codes and free shipping from your favorite online retailers. Unplanned purchases cut into your savings potential. Even small splurges can add up quickly. When you find yourself wanting to buy something you didn’t budget for, make yourself wait for at least 24 to 48 hours. Look at your budget to decide how it will impact the other budget categories. You may find the urge to splurge passes when you hold off on the purchase. There are several reasons why Americans are not saving enough money. Your core expenses typically come up on a monthly recurring schedule. Utilities, cell phones, cable, car payments, credit card payments and loan installments are all due on a set date each month. The bills seem fixed, but there is some wiggle room that can save you money. Cable and Internet services often offer several tiers of service, so you might be able to downgrade your package to save money. Not willing to give up your favorite channels? Call your provider to ask for any deals. Many providers will offer you special rates for a few months or longer to keep you happy. You can also check with other local providers to compare costs with competitors. If you rarely watch TV, consider giving up cable completely. Streaming services give you access to some shows and movies as an alternative to expensive cable. Power and water billing occurs at a set rate based on consumption. You can’t negotiate those rates, but you can control how much you use. Get your family on board with conserving water and power to lower your monthly bills. Simple changes like adjusting the thermostat, shutting off appliances you’re not using and shortening showers add up to savings each month. Switching from standard bulbs to ENERGY STAR bulbs and fixtures can cut your energy use by 70 to 90 percent, for example. When it comes to your loan payments, refinancing is an option that could save you money each month. If your interest rate is high compared to current rates, check into refinancing. Factor in the fees charged for the refinancing before deciding if you’ll save enough to justify it. Daily and monthly changes save you money immediately, but it’s your long-term savings efforts that help you reach your big goals. What are your big money goals? A huge trip? A down payment for a new home? A loan-free car purchase? Whatever the goal, planning to get there is essential. When you track your spending and saving, you can see the progress, so you know when your goal is within reach. Start by identifying a specific goal or goals. What do you want to do? How much money do you need to achieve that goal? Determine how much you can put aside each pay cycle to reach those goals. Monitor the savings as it grows to ensure you stay on track. You can also save long-term by making smart decisions with your large purchases. A shiny new car is appealing, but it also means you’ll have a large car payment. Instead, drive your old vehicle a few more years, or choose a cheaper car. Downsizing your home or staying in your starter home instead of upgrading to a larger house keeps your housing expenses low, so you can save toward long-term goals faster. When you create a budget, you divide your income among your expenses. 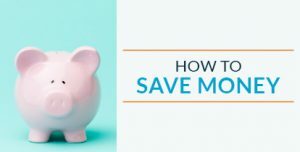 The budget is a simple way to make sure you’ve covered all your bills and discretionary spending, but it’s also an important part of your savings strategy. If you’re one of the many Americans wondering, “How much will my paycheck be after taxes?” don’t fret. First things first: Use this income after taxes calculator to see how much you bring home, and how payroll adjustments can change that amount. If you want to save aggressively, the 50/30/20 budget is one useful approach. Instead of allocating all your income toward spending, it puts a heavy emphasis on saving. In this budgeting method, “50/30/20” refers to the percentages of your take-home income you designate toward certain things. In a 50/30/20 budget, 50 percent of your income goes toward your basic living essentials. These are the bills you must to pay each month, such as your housing, utilities, transportation, insurance, and food. Everyone has these expenses, and they can really add up. Limiting those areas to just half your income can be challenging. For example, if your monthly income is $5,000, you would need to cover all those essentials with only $2,500. The next part of the equation is the 30 percent that goes toward your personal spending. These are the extra things you don’t really need but buy anyway. Things like your cell phone, cable, Internet, dining out and entertainment fit this category. Our example of a person who earns $5,000 per month would have $1,500 to spend on those personal expenses. The final 20 percent of your income goes toward savings and paying off debt. If you make $5,000 per month, that means $1,000 would go to savings. This includes things like paying down credit cards quickly, contributing to a retirement fund, filling your emergency fund and putting money into savings for long-term goals. Keep in mind that you don’t have to spend the full 50 percent on essentials or 30 percent on personal spending. Those numbers are the maximum you can spend on each of those categories. If you can come in lower, you’ll have more money to add to the savings part of the budget. Say you can cover your monthly essentials on 40 percent of your income. Instead of spending that extra 10 percent on fun things, put it directly toward the savings category. If you choose to live a minimalist lifestyle, you might cut your personal spending to less than 30 percent, so the rest can go toward saving. “Should I pay off my credit card or save?” It’s a common question, considering the average credit card debt totals $16,883 in households with credit card balances. Credit cards cost the average household $1,292 in interest each year. Total debt, including mortgages, averages $137,063 in households with any type of debt. Think about how much money you could free up if you paid off your debts. It can be a challenge to decide between paying debt and building your savings. Usually, a balance between the two is beneficial. You don’t want to have $0 in savings, or you’ll likely need to charge unexpected expenses to credit cards. Building a modest emergency fund gives you some security while you pay off your debt. Once you have the safety net of an emergency fund, start paying down your credit card debt aggressively. Paying just the minimum payment won’t get you out of debt anytime soon. You’ll also end up spending a lot more on the interest. Use our credit card payment calculator to see how quickly you can pay off credit cards by adding extra payments each month. Three out of five Americans faced a major unexpected expense in 2016, according to Bankrate. If an unexpected expense hasn’t popped up in your life, the odds are good you’ll face one at some point. Do you have enough money to cover an unexpected car repair, medical bill, appliance replacement or home repair? Many people are only one major expense away from financial disaster. An emergency fund is a savings account designed to cover the unexpected expenses that inevitably happen in life. Having money in your emergency fund gives you a safety net. Instead of reaching for your credit card to cover that $800 mechanic’s bill, you can pay for it with cash out of the fund. It’s a great way to keep yourself out of debt or avoid increasing your debt. How much do you need in your emergency fund? One common recommendation is to save the equivalent of six to nine months of your income. While an emergency fund that largely does provide a great deal of security and peace of mind, it’s unrealistic for many people, especially those who are living paycheck to paycheck. Instead, start with a smaller, more realistic goal to kickstart your emergency fund if you don’t have one yet. A good goal is $500. Most people can save that amount relatively quickly, and it would cover a large chunk of many unexpected expenses. Saving $500 feels like an accomplishment that can motivate you to continue saving more money. After hitting the $500 mark, increase your emergency fund goal to $1,000. Challenge yourself to see how quickly you can get there. Keep increasing your goal until you reach an amount that makes you feel comfortable. Check out these tips to reach your emergency fund goal faster. Prioritize building your emergency fund: Put everything you can into building your emergency fund. Temporary sacrifices to find the extra money for the account pay off when you have that safety net in place. Save your change: When you pay for any purchase with cash, toss the change into a jar. When the jar is full, take it to the bank to deposit into your emergency fund. Make savings automatic: If your employer offers direct-deposit payroll, set it up so a percentage of your earnings automatically transfers into your emergency fund on payday. You’ll never see the money in your checking account, so you won’t be tempted to spend it. Pick up extra work: Consider a part-time job or freelance work while you’re building your fund. Put all paychecks from the extra work directly into the emergency account. Sell items: Don’t have time for another job? Sell items you no longer use to make quick cash for the account. Don’t use it unless it’s a true emergency: Getting tickets to see your favorite band is not an emergency. Neither is buying extra Christmas gifts. Your emergency fund is just that: an account for real emergencies. Replenish the account: If you need to tap into the account for an actual emergency, work to replenish the amount you use as quickly as possible. You never know when the next unexpected expense will strike. When you file your taxes, you have the option of taking the standard deduction, which is a set amount or itemizing your deductions. For the 2017 tax year, the standard deduction for individual filers is $6,350. For a married couple filing jointly, the standard deduction is $12,700. The IRS reviews the amount regularly, so those amounts can fluctuate slightly to account for inflation. Use our tax deduction calculator to decide if it’s better for you to take the standard deduction or itemize. If you itemize, you can limit your tax bill and boost your savings by taking as many deductions as possible. Maximizing your deductions can help you increase your tax refund. While most look at a tax refund as free money, it is a sign that you need to change your paycheck withholdings. Double check to make sure your tax refund is not costing you money. Consider putting that extra money into your savings account instead of giving too much to the government will help you benefit the most from your earnings. However, if you are expecting a tax return here are reasons you might want to itemize. Itemizing takes a little more work because you have to list the individual deductions and corresponding amounts, but you can end up with a higher deduction amount than the standard deduction. You can deduct expenses like medical and dental expenses, mortgage interest, charitable contributions and various business expenses. If you have several expenses that qualify, you may end up with a higher deduction by itemizing. Why do you want to deduct the highest possible amount? Tax deductions lower your taxable income, also known as your adjusted gross income. The taxes you owe are calculated on the lower amount after the tax deduction is taken. That means you could end up with more money on your tax return if you maximize your deductions. Put that tax return money into your savings account for a quick boost toward your savings goals. What are your favorite ways to save money? Check out our financial calculators to learn how different financial decisions will affect your savings.